1311 Thanks for your many, many comments - especially about Spain, its non-membership of the G20, or its temporary membership via the EU seat. As Ross said, it really was classic PMQs stuff this week. Please join us again next Wednesday for an extended live event with PM's questions followed by Chancellor Alistair Darling's much-anticipated pre-Budget report. Are we governed by gorwn-up's or by school age kids? It seems that a large majority of the HOUSE are no better than kids in a playground and they want a pay rise to act like this. Is it any wonder that the average person in this country has no time for these pretend adults. How nice to see that Mr Brown can make light of a serious question about Afghanistan. Let's hope his respects paid to the fallen were not also meant lightly. 1305 Will the Spain fax pas be an ongoing embarrassment for Mr Brown? Who knows? A week is, as they say, a long time in politics, but expect several jokey mentions by the prime minister's opponents before the next PMQs. Perhaps there will be a campaign to set up a G21 group, to include Spain? Richard - Spain is a G20 member via the EU? I wonder if all the PMQs between now and the GE will be this thin on detail and thick on noise and counterclaims? Graham - Afghanisation is the process of handing the country over to the indigenous elite. 1258 Mr Brown's comments about the economy have raised a lot of comment from readers. The PM said Spain was another member of the G20 group still in recession. But a quick look at the G20 website shows Spain is not in the G20. They are invited to attend apparently. We tried to check with the Treasury but they have referred the question of Spain's membership to Downing Street! 1257 John Hutton says people are not bothered by which school people attended, but are concerned about whether "they are in touch". 1256 On to the old school debate again. Andrew Lansley says the Tories are recruiting candidates "from all backgrounds" after he is told the party is trying to talk up its non-public school educated spokespeople. 1255 A Downing Street spokesman says Mr Brown is pleased that the five yachtsmen captured by the Iranian authorities have been released.There was no mention of the subject at PMQs. 1255 Actor Brian Cox is on the Daily Politics, wondering whether an "elite" might re-assert itself if the Tories win power at the next general election. Relocating civil servants to help the regions, extending and defending the role of post offices, promoting languages...why is it that the Govt produces far more good ideas close to an election? Do neither Gordon Brown nor David Cameron realise that Spain is not a member of the G20 group of countries? Will the prime minister address the issue of livestock's impact on climate change (18% of GHGs are caused by the livestock industry) in Copenhagen next week? The pime minister seems to think Spain is in the G20! Perhaps he'd better check membership. Gordon Brown has made some sensible points and I am glad he highlighted Tory plans to cut inheritance tax. PMQ's are priceless, are these on the Iplayer ever? I have not watched this for a long time and it's great! 1246 Shadow health secretary Andrew Lansley accuses Mr Brown of the "politics of envy", after the PM made jokes about David Cameron's Eton education. He says Mr Brown is "behind" the rest of the world in leading his country out of recession. 1245 Former defence secretary John Hutton tells Daily Politics that the country will get behind the troops if they understand the mission in Afghanistan. It would be "terrible" if it becomes a party issue, he adds. I wish I was an MP, they're all having so much fun at question time today - so far a massive percentage of questions have been avoided, no straight answers - lots of laughs and jearing - whilst the rest of us are enduring hard times. Our elected members would look more at home under a 'big top' rather then Westminster. Brown says we're not the last country out of recession - Spain is also struggling. So that's okay then! Since when was Spain in the G20? Is Gordon Brown making up a new word? What is Afganistation? 1237 That was quite a loud session, with a fair bit of shouting. Perhaps the Labour benches - told off by Speaker John Bercow - felt buoyed by a fairly upbeat performance by Mr Brown? 1234 On the post office network, Mr Brown says the government is giving it "new purpose". That's it for PMQs for another week. 1234 From BBC political correspondent Ross Hawkins: The Speaker said honourable members seemed to be enjoying themselves today. The prime minister certainly appeared to be having more fun than usual with his putdowns of the opposition. No one learned much in the to and fro about the state of the economy, where David Cameron was educated, and whether President Obama would care much for Nick Clegg's opinions. It was light on information, heavy on pre-election jeering - a classic PMQs. 1233 Sir Peter Tapsell, the longest-serving Tory MP, says President Obama's announcement means he was right all along about troop numbers in Afghanistan and asks if Mr Brown will resign. Mr Brown thanks Sir Peter for his advice. 1231 Tory Tim Yeo asks whether the "fall in green taxes" during Mr Brown's tenure as chancellor should be reversed. Mr Brown says air passengers are paying higher taxes, but says he opposed putting VAT on fuel. 1230 Plaid's Elfyn Llywd asks what Welsh voters can expect from the money they are paying towards the London Olympics. Spending on Wales has risen "markedly" under the Labour government, Mr Brown says. 1228 Tory Gregory Barker asks about EU financial regulation - the subject of criticism by Chancellor Alistair Darling. Mr Brown replies that British policies are making the running in Europe. 1227From BBC political correspondent Ross Hawkins: Chris Ruane's was the second gag about Etonians on the Conservative front bench this session. It takes a while to get to the punchline. David Cameron and George Osborne looked unmoved. 1225 It's all calmed down now and there's another friendly question. Labour's Chris Ruane mocks the Tories over their economic policies. Mr Brown does the same. 1224 On the recent floods, Mr Brown says investment in managing such crises is higher than ever. 1224 Labour's Roger Berry says the Tories are divided over climate change. Mr Brown says the Copenhagen conference, starting next week, will have to make sure that targets are sufficiently ambitious and that he hopes for all-party support for a deal. 1223 Easiest question ever? Hove Labour MP Celia Barlow praises a lens-making firm in her constituency. Mr Brown echoes the sentiments. 1222 From BBC political correspondent Ross Hawkins: The leader of the Liberal Democrats Nick Clegg tried to make himself heard in a noisy chamber as he talked about President Obama's "important" announcement. "President Obama will be grateful for his endorsement," remarks a straight faced prime minister, delighting his backbenchers. 1221 Mr Clegg says countries near Afghanistan, such as China, must be involved in securing the region. Mr Brown says it is right that this is the case. 1220 Lib Dem leader Nick Clegg talks about the US announcement on troop numbers and says it is best not to "over-rely" on Afghan president Hamid Karzai to help the UK's strategy. Mr Brown jokes that President Obama will be "grateful" for Mr Clegg's endorsement of the surge in US forces in the country. He adds that there is "no blank cheque" for Mr Karzai and that he must stamp out corruption. 1219 From BBC political correspondent Ross Hawkins: A rather sober discussion about Afghanistan has turned into a Punch and Judy PMQs row about the economy. The prime minister had a new soundbite to try on David Cameron: "The voice may be that of a modern public relations man the mindset is that of the 1930s." The leader of the opposition mocked ministers he said should have been defending marginal seats. Get used to the noise - this is what the general election campaign will sound like. 1217 Actress Reese Witherspoon, in Westminster today to campaign against domestic violence, gets a mention. Mr Brown praises her but initially calls her "Renee" by mistake. 1215 Mr Bercow steps in again, to tell Culture Secretary Ben Bradshaw to keep quiet. The leaders are now debating inheritance tax plans. 1213 Speaker John Bercow steps in to warn Labour backbenchers to quieten down. Mr Cameron says Children's Secretary Ed Balls is being noisy too and says he should be concentrating on defending his marginal seat. He adds that perhaps Mr Balls thinks that the more constituents he meets the greater the Tory chances of success are. Mr Brown replies that, the "more" Mr Cameron talks, "the less he says". Labour MPs liked that one too. 1211 The noise level is rising. Mr Cameron asks what the PM meant when he said Britain was "leading" other countries out of recession. Mr Brown goes on to say the Tories were wrong on the recession and on the recovery. He says Mr Cameron has the voice "of a modern PR man", but a mindset "from the 1930s". Labour MPs liked that. 1209 Mr Cameron moves on to the economy, saying Britain is the last member of the G20 to move out of recession. Mr Brown says this is not the case, citing the example of Spain. He accuse the Tory leader of "talking down Britain". 1207 Mr Cameron says the planned transfer of some Afghan provinces to Afghan control from next year was reported in the media as a "commitment". The government should not give false hope to troops, he adds. Mr Brown says there is no question of withdrawing troops until this can be properly achieved. He tells MPs it is crucial that Afghan troops are properly trained and that the UK will "stay and do the job". 1204 Tory leader David Cameron also pays tribute to the soldier killed in Afghanistan. He asks whether UK forces should be concentrated more effectively to deal with specific threats and offer protection to civilians. Mr Brown says this is the government's policy. 1202 First up is Labour's Doug Naysmith. He asks about Colchester and Basildon hospitals. He asks whether patient safety is the NHS's priority. Mr Brown says it is. 1201 Gordon Brown begins by paying tribute to soldiers killed in Afghanistan. 1200 Andrew Lansley says that parties should not live by opinion polls. 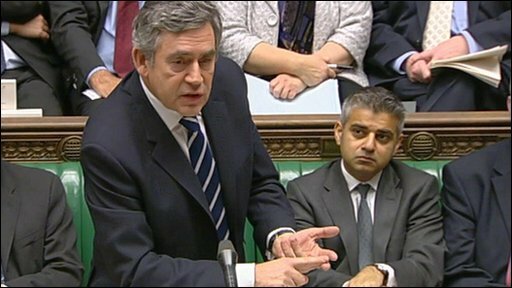 In the Commons Gordon Brown gets to his feet. 1159 BBC deputy political editor James Landale tells Daily Politics there are some Tories who are "very nervous" about opinion polls which seem to suggest a narrowing of the lead over Labour. But others say it will help prevent complacency, he adds. 1157 Just a few minutes to go now. The Commons is looking pretty full, particularly on the Labour benches. For the Tories, Ken Clarke is in place. 1154 Back in the Commons, the benches are filling up steadily, as international development questions continue. UK aid to Afghanistan is being debated. A warm-up for PMQs? 1152 Shadow health secretary Andrew Lansley tells Daily Politics the US reinforcement in Afghanistan is not just about achieving a military objective but about building security in the country "with the intention of leaving". But attaching a timeline "obviously has risks", he adds. 1150 Former defence secretary John Hutton tells BBC Two's Daily Politics the European members of Nato must "step up to the plate" following the US's commitment to send 30,000 more troops to Afghanistan. 1149 From BBC political correspondent Ross Hawkins: After President Obama's announcement in the small hours Afghanistan seems almost certain to feature in today's session. Those on the Labour side might well remind David Cameron of his apology to the House after making a factual error in a question he asked last week. 1147 Before the main event gets under way, it is international development questions. A lot of talking on the back benches. Will Speaker John Bercow step on again to quell the noise, as he has done several times in recent weeks? 1145 Unusually for Westminster, there's a bit of Hollywood stardust around today. Actress Reese Witherspoon is around to promote a campaign to end domestic violence against women. 1144 Top of the list to ask questions of the prime minister this week is Doug Naysmith, Labour MP for Bristol North West. Tory Ben Wallace and Labour's Roger Berry are next in line. 1143 It is crisp and cold at Westminster, with only two more PM's questions to go until the Christmas recess. The Iraq Inquiry is taking a break for the day but, given the claims made about UK intelligence in the lead-up to the war, it could feature prominently. 1142 So, what's the likely agenda today? It would be a huge surprise if Afghanistan didn't feature. Financial regulation is another good bet, with Chancellor Alistair Darling warning against more EU supervision of the City. The release of the five British yachtsmen freed by Iran? Maybe. And, with less than a week to go before the Copenhagen climate change talks get under way, the subject could well crop up. 1140 Hello and welcome once again to our live video and text coverage of prime minister's questions. On a day when the planned US troops surge in Afghanistan is making the headlines, my colleague Ross Hawkins will be providing analysis. 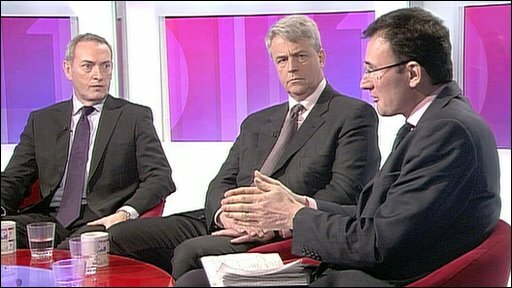 Meanwhile, courtesy of BBC Two's Daily Politics, former defence secretary John Hutton and shadow health secretary Andrew Lansley will give their views.